Total contact casting is a method used to treat diabetic foot ulcers by fitting a non-removable cast around the affected leg. The whole cast is in contact with the foot and part of the leg, hence the name. The cast is usually made of fiberglass or plaster and is designed to protect the ulcer and allow wound healing. One of the primary reasons for treating diabetic foot ulcers with total contact casting is offloading, or limiting the use of the foot with the ulcer. Diabetic patients who already have diabetic neuropathy are at the greatest risk for ulcers since the loss of protective sensation in their limbs prevents early detection of any injuries to their feet. The peripheral neuropathy may also cause foot deformities by paralyzing the muscles of the foot, causing clawing of the toes and producing bony prominences that are subject to pressure. 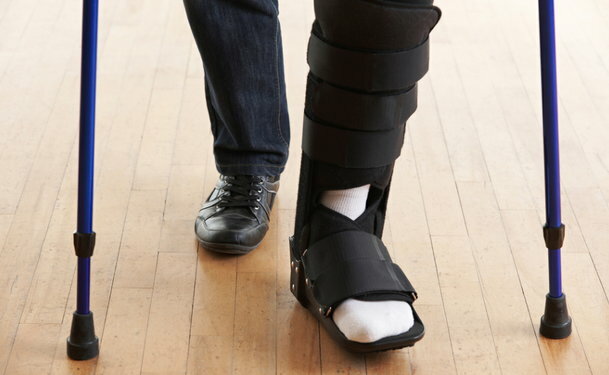 Fractures can develop without the patient’s awareness of them, resulting in a condition known as Charcot foot. Total contact casting relieves pressure on the affected foot, which enhances healing by taking pressure off the ulcer and the other areas of the foot most prone to injury. Total contact casting is done by molding a cast over the entire surface of the foot and part of the leg. A soft layer of foam is placed on the ulcer, and the whole foot is wrapped in bandages prior to the application of the cast. The cast, which follows the contours of the foot, is designed to distribute the weight evenly over the entire weight-bearing surface of the foot. This results in offloading of pressure from the ulcer and the bony prominences of the foot. Healing of ulcers using total contact casts takes approximately six to eight weeks, during which the cast is replaced on a weekly basis. The cast is removed when complete healing is achieved, after which it is recommended that the diabetic patient wear specially designed shoes. Medical or surgical treatment may not be adequate for diabetic foot ulcers. Even if the best care is given, healing may be delayed if the ulcer is subjected to constant pressure while walking. Total contact casting provides optimal wound healing conditions by ensuring that the ulcer is not further traumatized and also prevents the development of new ulcers in the bony prominences of the foot. A patient scheduled to receive a total contact cast should be properly informed of the procedure, since this treatment will impose limitations on freedom of movement. Walking should be done with the aid of a cane or crutch in order to avoid exerting any pressure on the affected foot and to prevent any fall-related injuries. Any development of hip or back pain should be reported to a doctor, as this may signal musculoskeletal strain due to the cast. The cast should remain dry, so the patient is advised to take sponge baths instead of showers.